MANILA, Philippines - More Filipinos nationwide tuned in to ABS-CBN to watch the most beautiful women from all over the world compete in the 65th Miss Universe pageant, as the Kapamilya network’s live telecast and special coverage won in national TV ratings. More viewers watched the ‘most beautiful day in the universe’ in the Kapamilya network as the coverage hit a national TV rating of 27.4%, or ten points higher than GMA’s telecast, which only registered 17%, according to data from Kantar Media. 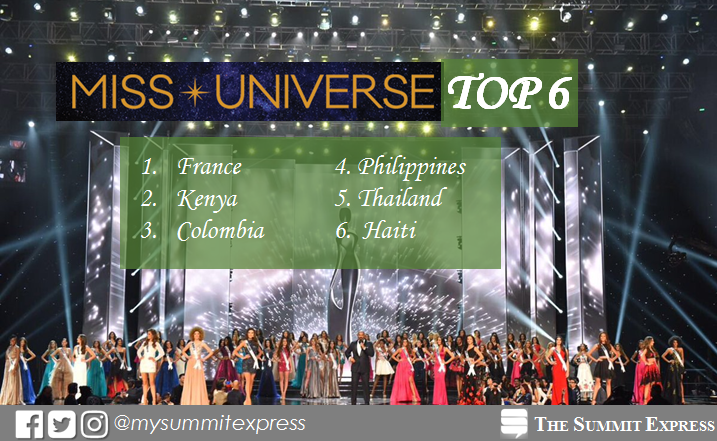 Viewers in Mega Manila and Metro Manila also followed the journey of Miss Universe-Philippines Maxine Medina, who made it to the top 6, on ABS-CBN. The Kapamilya network recorded a TV rating of 28.2% versus GMA’s 23.7% in Mega Manila, while it hit 30.8% versus GMA’s 19.4% in Metro Manila. After the pageant and coronation of the newest Miss Universe Iris Mittenaere of France, Gretchen Fullido pumped up the pageant fans as she immediately gave a recap of the competition event at the SM Mall of Asia Arena in the news program “News Patrol,” which got a national TV rating of 20.2%, compared to GMAs 17.2%. Right after “News Patrol,” Dyan Castillejo kept viewers in the loop in a live coverage of the first press conference of the newly hailed Miss Universe on DZMM TeleRadyo. Since the announcement of the Philippines as this year’s host of the Miss Universe competition, ABS-CBN has brought to Filipinos, who are known to be the best pageant fans in the country, the latest news and the most comprehensive coverage of the competition. 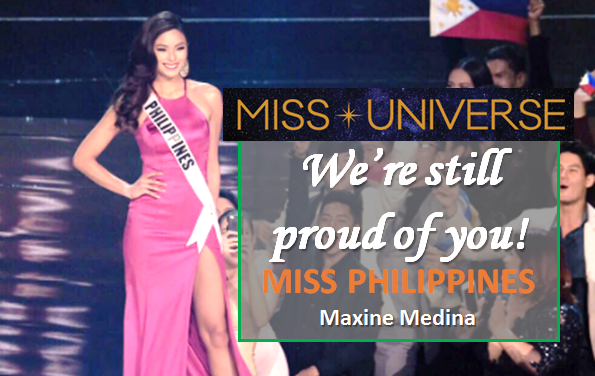 Aside from the regular features in news programs such as “TV Patrol” and “Bandila,” news.abs-cbn.com made a microsite to deliver to fans the most recent happenings in the pageant, including the preparation of Maxine, as well as the 86 candidates of Miss Universe. ABS-CBN partnered with Solar Entertainment, LCS Group, and the Miss Universe Organization to become an official network partner of the 65th Miss Universe pageant to bring the annual event to a wider audience. ABS-CBN has been the home of Miss Universe on Philippine television since 2010, the year when the country once again entered the top 5 with Venus Raj. Viewers also watch on ABS-CBN the journey of other Miss Philippine-Universes namely Shamcey Supsup-Lee, Janine Tugonon, Ariella Arida, Mary Jean Lastimosa, and Miss Universe 2015 Pia Alonzo Wurtzbach in its broadcast via satellite from the United States (2010, 2012, 2014, 2015), Brazil (2011), and Russia (2013). 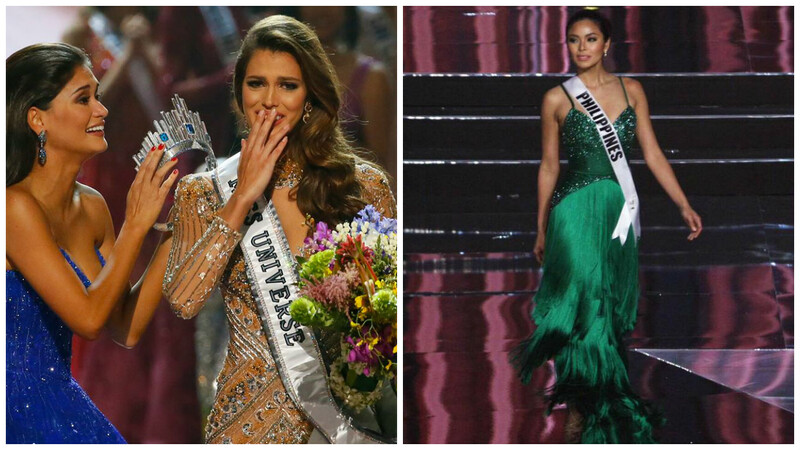 Don’t miss the replay of the 65th Miss Universe pageant on Sunday (Feb 5) in Sunday’s Best. MANILA, Philippines - The most beautiful day in the universe has arrived as 86 lovely ladies from around the world competed in the Grand Coronation Night of the prestigious 65th edition of Miss Universe on Monday, January 30, 2017 ( Sunday, January 29 in USA) at the Mall of Asia Arena in Pasay City, Philippines. On this page, witnessed once again how the Philippines took spotlight on the successful hosting of Miss Universe. The Miss Universe Red Carpet was one-hour live show featuring interviews from a Live Lounge with the panel of A-list judges, top musical performers and contestants. The special was hosted by Bretman Rock with special correspondent Venus Raj. Meanwhile, the 65th Miss Universe coronation was broadcasted live on three giant television networks in the country - ABS-CBN Channel 2, GMA-7 and TV5 from 8:00 in the morning. This is in partnership with Solar Entertainment and made possible through the request of President Rodrigo Duterte. In addition, TV5 has the exclusive Philippine digital rights. The network said to post behind the scenes content on their online TV5 studio. 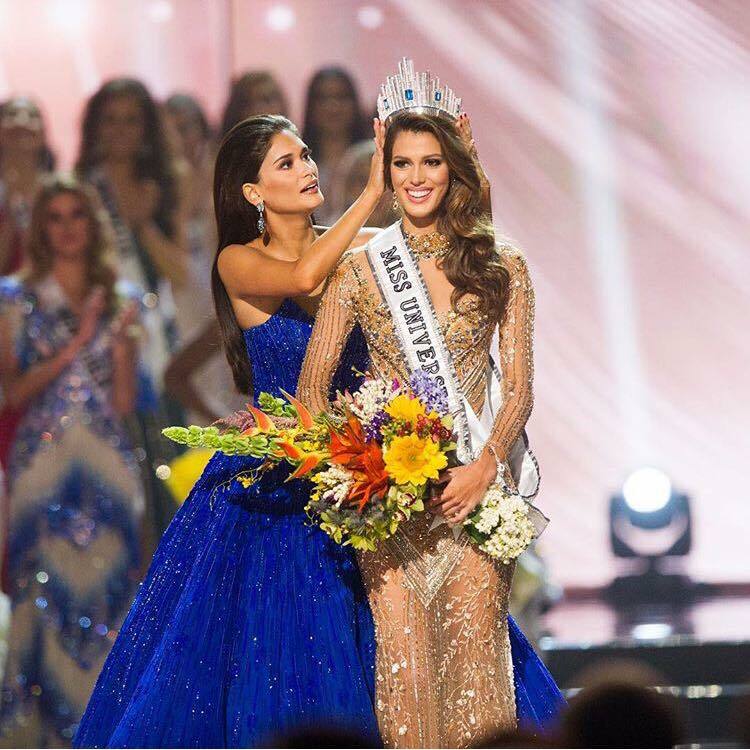 What was Miss Universe Iris Mittenaere's exact answer to the Top 3 Q&A? MANILA, Philippines - Several netizens have pointed out that Miss Universe Iris Mittenaere’s interpreter wrongly translated her final answer in the 65th Miss Universe pageant. French-speaking netizens such as French-Filipina actress Solenn Heussaff called out the French beauty queen’s interpreter for the incorrect translation. Miss France Iris Mittenaere and Miss Universe host Steve Harvey during the pageant's Q&A. Mittenaere answered in French which was translated in English by her interpreter. Heussaff, who speaks French fluently, took notice of the discrepancy between Mittenaere’s answer and the translation. On Twitter, Heussaff wrote: "French translator said: when i missed my first casting. But she (Mittenaere) really said '1st year of Medicine school.'" During a post-pageant conference, the newly-crowned Miss Universe admitted that her answer to the final question was interpreted differently. Despite this, Mittenaere said her translator was very good. "When I was in my first year of medicine, the first time I didn't have my first year. And I cried a lot, and I said 'Oh my God, and I have now to do it again.' After that I saw I wasn't on the list, I go and I bought another book for medicine immediately,"Mittenaere said. "They called me in one week after this, they said 'Actually this was a mistake. You have your first year of medicine. You succeed,” she added. MANILA, Philippines - After showcasing their beauty clad in their national costumes, swimsuits and evening gowns, the top 6 Miss Universe finalists proved they also got the brains by answering tough questions in the question and answer portion of the prestigious pageant. Miss Universe 2016 Top 6 candidates. 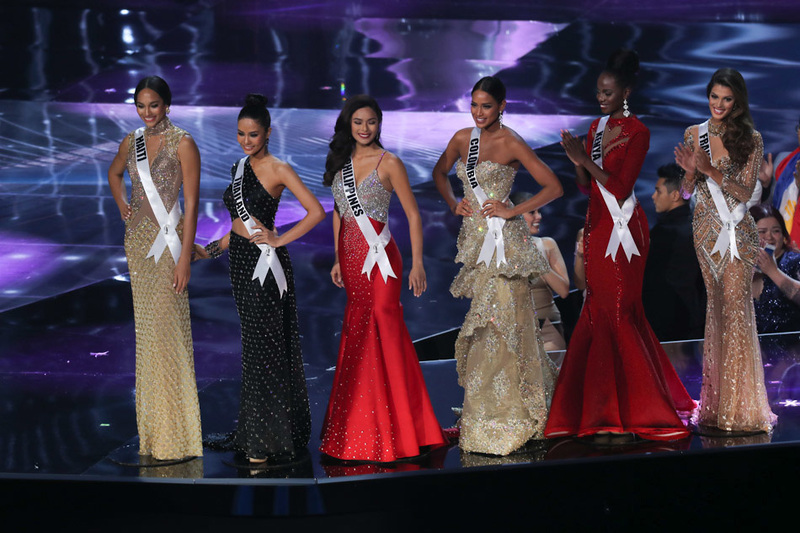 While beauty remains to be a top consideration in choosing the new Miss Universe, the candidates’ answer to the questions also helped judges in selecting the rightful lady to the crown. Question: What is the most significant change you’ve seen in the world in the last 10 years? Answer: In the last 10 years of being here in the world, I saw all the people bringing in one event like this in Miss Universe. It’s something big to us that we are one. As one nation, we are all together. Thank you. Maraming salamat po. Question : Arguably, no United States president has had a more active first 10 days in office. What are you most excited about and what most concerns you when it comes to the presidency of Donald Trump? Answer: Politics is... Okay, let me just start again. Donald Trump has been elected as the president of the United States. (He) may not be the choice of many people living in the United States because of the divided support system for the outgoing president, Barack Obama who supported an upcoming woman president, who was supposed to be a woman president, Hillary Clinton, so so many people opposed his position. But I feel that once he took up his position, he was able to unify the entire nation. Question: Name a current or past leader whom you admire, and why. Answer: For me, the King of Thailand. His Majesty has been working tirelessly on behalf of the Thai people ever since I was born. For all the Thai people, His Majesty has been like a father to us. Thank you very much. Question: Given today's worldwide refugee crisis, do countries have an obligation to accept refugees or do they have a right to close their borders? Answer: The country should have the right to open or close their borders so throughout the world, people can choose to have the borders opened or closed. In Europe, we have opened borders. In France, we want to have the most globalization that we can. We want to have the biggest exchange of people that we can. And maybe someday that will change, but now, we have opened borders.So having opened borders allows us to travel more through the world and to find out more about what's out there in the world. Thank you very much. Question : On January 21st, an estimated 4.8 million people marched worldwide for human rights, women's rights and other issues. If you were able to participate, what would you have been marching for? Answer: Hello, everybody. One of my, one of the women I admire in the world is Eleanor Roosevelt because she fought so much for human rights. And I feel that that's what we need in the world. We are just one. A hundred thousand years ago, 6 species of human lived in the world. Now, we are just one and we all need each other and we need to respect each other. Question: Why do you believe that violence is so prevalent in today's society and what can we do about it? Answer: Well, I come from a country that does have violence, and this is my reference point. And although there are presidents who don't get along well with others, we work together to be able to unite. Campaigns, respect and inclusivity to be able to have a social transformation that will educate our children. Thank you very much. For the top three finalists, only one question was asked. While one candidate was asked to answer the question, the two others waited for their turn with noise-cancellation headphones on. Question: Name something from the course of your life that you failed at, and tell us what you learned from that experience. Miss Haiti and Miss Universe 2016 first runner-up Raquel Pelissier responded: "About seven years ago, I survived the earthquake. I felt I was filing myself because I wasn't living my dreams; I was living day by day, and that earthquake, it was a bad event, but I chose to be a very positive person and learn a great lesson from it because if I am here today, it's because I am living my dreams." Miss France Iris Mittenaere who took home the crown said: “I've failed several times in my life. I thought I failed the first time I went out on a casting because my name wasn't on the list, and the very next day I found that I was in a new book. So, I think that when you fail, you have to be elevated, and you have to try again and keep going. If tonight, I'm not one of the winners, I would still have had the great honour of being one of the three finalists. So, I think that I have failed before, but for me this is a great first opportunity." MANILA, Philippines - Twenty-three years after the Philippines first hosted the Miss Universe pageant, the country has once again taken world spotlight as 86 beautiful women from all over the world visited Manila to compete for the highly coveted title. Pinay beauty queen and Miss Universe 2015 Pia Wurtzbach passed her title to France’s bet Iris Mittenaere during the grand coronation night of the 65th Miss Universe pageant held on Monday, January 30 at the Mall of Asia Arena. Mittenaere, a 24-year-old Dentistry student, bested 85 other candidates from all over the globe including the country’s bet Maxine Medina who made it to the top six of the competition. 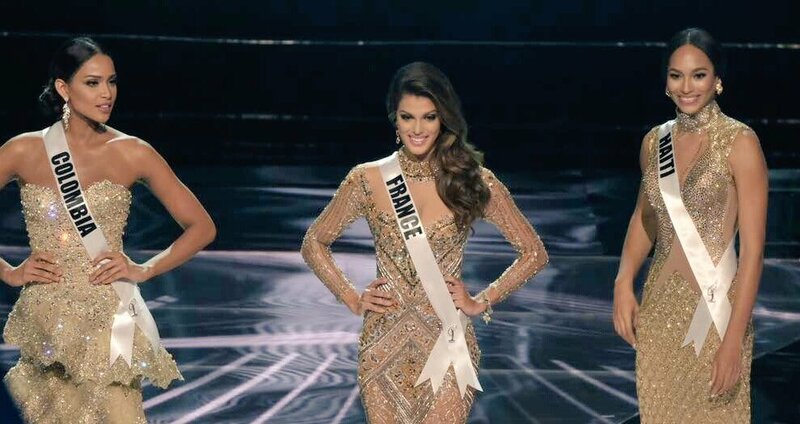 The second Miss Universe titleholder from France, Mittenaere ended 63-year drought for France. The country last won the title in 1953 with the victory of Christiane Martel. Meanwhile, Malacañang congratulated Mittenaere shortly after she was proclaimed the new Miss Universe. Among the Top 6 candidates, Medina was the first to give her response during the question and answer portion. Although Medina has earlier expressed her willingness to get an interpreter after being criticized for having poor English communication skills, Medina chose to give her answer in English. Her interpreter only translated the question from English to Filipino. "In the last 10 years of being here in the world, is that I saw all the people bringing in one event like this, Miss Universe. And it's something big to us that we are one, as one nation we are all together,” Medina said. Several netizens expressed their dismay after hearing Medina’s response. Others even suggested that Medina should have sought the help of her interpreter in delivering her answer. “Hindi ako nanghihinayang sa kanyang sagot,pero ako ay nanghihinayang dahil meron siyang interpreter tapos sinagot nya ang tanong sa English. Feeling ko, kung nagsalita lang siya ng Filipino hindi siya mahihirapan sa pagsagot sa tanong,” Nylinej Ratunil commented. Robert James wrote: “It’s not about her grammar but I do think she has some sort of anxiety answering in front of people. Also, answering a question with the whole world watching you is difficult but honestly, I think Maxine got away with the easiest. The other questions were too loaded for a beauty competition. Others were quick to defend Medina, saying her critics should put themselves in her shoes. “Maxine Medina reached top 6, among those 86 candidates. And it's not bad either. Now tell me, what's wrong people? Next time, you must volunteer yourself to be the representative of our country, and you "MUST" be the winner,” a certain Jennifer Olaran said. Despite her loss, Malacañang expressed their support to Medina. “She represented the Philippines well in the international scene,” the Palace said in a statement. MANILA, Philippines - Miss France Iris Mittenaere is the new Miss Universe! Miss Universe 2015 Pia Wurtzbach crowned the new Miss Universe, Miss France! This was announced by the controversial host Steve Harvey during the 65th Miss Universe pageant on Monday, January 30 at the Mall of Asia Arena in Pasay City. In the Question and Answer portion, Mittenaere, who has toppled 85 other candidates, praised France's open borders and refugee population. "In France, we want to have the most globalization that we can, we want to have the biggest exchange of people that we can," the 24-year-old told the judges. Miss France made history as she snaps the 64 year title drought, to take home France's second MissUniverse crown. Miss Colombia Andrea Tovar was named second-runner while Miss Haiti Raquel Pelissier was the competition's first runner-up. The competition's top 13 finalists were Kenya, Indonesia, Mexico, Peru, Panama, Colombia, Phillippines, Canada, Brazil, France, Haiti, Thailand and Miss USA Deshauna Barber. Philippine bet Maxine Medina finished the competition joining Top 6. In the Q&A, Medina was asked: "What is the most significant change you've seen in the world in the last 10 years?" "The last 10 years of being here in the world is that I saw all the people being in one event like this in and it's something big to us that we are one, as one nation, we are all together," Medina answered in the English language despite having an interpreter. Medina, a model and interior designer, is supposed to get a back-to-back victory even as the pageant is held in her home country. Her predecessor, Filipina-German Pia Wurtzbach, was crowned Miss Universe in 2015. MANILA, Philippines - After the nerve-racking Question and Answer (Q&A) portion, Philippine bet Maxine Medina is out of Miss Universe competition as she did not join the pageant’s Top 3. Miss Colombia, France and Haiti are moving to the Final Look of the 65th Miss Universe. The other candidates that made it to the Q&A competition are from Kenya and Thailand. MANILA, Philippines - Miss Universe 2015 Pia Alonzo Wurtzbach from the Philippines crowns her successor today, January 30, 2017 in the 65th Miss Universe coronation at the Mall of Asia Arena in Pasay City. For the 86 ladies vying for the title of Miss Universe 2016, view the complete list of winners as announced by organizers. Miss France Iris Mittenaere is the new Miss Universe! UPDATE: Miss France Iris Mittenaere was crowned the new Queen! Miss Haiti and Colombia were the runners-up! Despite all criticisms, Miss Universe Philippines Maxine Medina, a strong contender to win the crown, is looking for a historical back-to-back win for the country. The only consecutive victories in history was in 2008 and 2009 when Stefanía Fernández and Dayana Mendoza of Venezuela won. After the three-day preliminary shows which include interviews, swimsuit and evening gown presentation, Miss Universe announces the Top 13 candidates who will sashay down the runway in their swimsuits. Based on the average scores from the judges and global fan votes, the list will be trimmed down to 9 who will enter on the long gown competition. Then, the Final 6 will be named for the most-awaited Question and Answer (Q &A) portion. This will be the basis for the Top 3 who will present their Final Look. NOTE: For the second year, fans will be able to vote for their favorite contestant during each stage of competition. The worldwide fan vote, in coordination with the judges, will help determine the winner of Miss Universe. According to Miss Universe website, this year's winner will immediately move to a luxury apartment in New York City, which will be her home base while she spends her reign traveling the globe, developing and representing her platforms, and raising awareness and funds for charitable initiatives. In addition to her new accommodations, the Miss Universe title also includes: a year-long salary; all paid living expenses; personal appearance wardrobe and styling by the official Miss Universe Organization fashion stylist; extensive international and domestic travel; and access to various New York City events including casting opportunities, movie premieres, fashion week, sporting events and career opportunities presented by one the world’s largest and most dynamic entertainment agencies, WME|IMG, parent company of The Miss Universe Organization. Emmy Award Winner Steve Harvey, who became controversial on last edition of the pageant, announcing the wrong winner (Colombia) instead of Wurtzback, is back to his hosting duties for Miss Universe 2016. Feature role model and body activist Ashley Graham will also join as a backstage host. The three hour special programming event will include musical performances from American singers Flo Rida and Boyz II Men. The judges are Miss Universe 1993 Dayanara Torres (Puerto Rico), Miss Universe 1994 Sushmita Sen (India), Miss Universe 2011 Leila Lopes (Angola), "Real Housewives of Atlanta" star Cynthia Bailey, Paper Magazine editorial director Mickey Boardman, and TV and film producer Francine LeFrak. 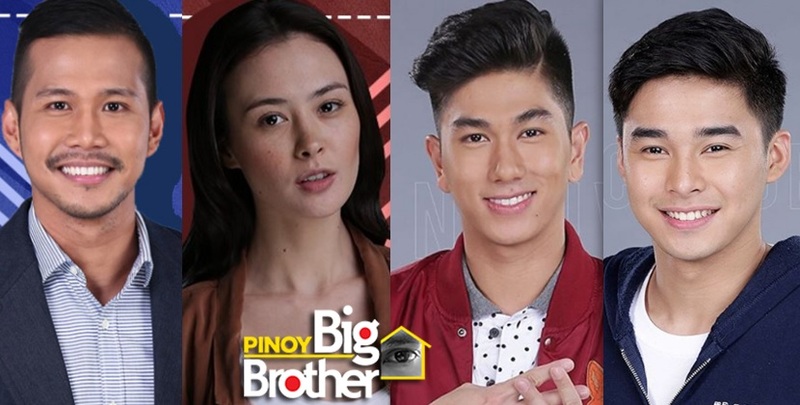 MANILA, Philippines - Four housemates are in danger of eviction on Pinoy Big Brother (PBB) Dream Team as announced during the second nomination night on Sunday, January 29. The second set of nominees were named based on the 'Lig-task' challenge and after the conventional voting system. Host Toni Gonzaga announced the five nominated housemates who got the highest number of votes from fellow housemates. This includes adult housemates Tanner Mata (8 points), Cora Waddell (7 points), two-in-1 housemates Mccoy De Leon and Nikko Natividad (7 points) and Jerome Alacre ( 5 points). Mata escaped anew from the danger of elimination after winning the the 'Lig-task' challenge on popping balloons. Voting lines are now open for the public to choose who they want to save (Cora, Nikko & Mccoy or Jerome) from the second eviction night next week. All the teen housemates - Edward Barber, Kisses Delavin, Maymay Entrata and Yong Muhajil were safe from eviction. Celebrity housemates Nonong Ballinan and Elisse Joson were also safe from elimination. MANILA, Philippines -The kiddie champ of The Voice, Lyca Gairanod, has impressed the judges as she impersonated American singer and Queen of rock & roll Tina Turner on ABS-CBN's top-rating singing reality show "Your Face Sounds Familiar Kids" on Sunday, January 29. Gairanod's breakthrough performance as Turner gave her a perfect score of 24 from the judges, the week 4 winner of the show. Aside from the P50,000 prize money, she also donated P50,000 worth of toys to her chosen charity. "Malinaw na malinaw na ginamit mo ang energy mo. Ito na ang breakthrough performance mo," judge Ogie Alcasid said. "Ngayong gabi, talagang binigay mo ang lahat," judge Sharon Cuneta said. WATCH: Awra Briguela transforms into Yoyoy Villame on "Your Face Sounds Familiar Kids"
Other performers of the night were Alonzo Muhlach as April Boy Regino and AC Bonifacio as Alanis Morisette. MANILA, Philippines - The 'Breakout Child Star' Awra Briguela, has impressed the judges on his impersonation of singer-comedian Roman Tesorio Villame popularly known as Yoyoy Villame during the fourth week performances on "Your Face Sounds Familiar Kids" on Sunday, January 29. Briguela delivered a superb and jolly performance singing Villame's "Butsekik." "Isa na naman itong nakakatawang performance! Lagi mo naman kaming pinasasaya," judge Sharon Cuneta has commented. "Nakakatawa ka talaga. Malakas talaga ang impact mo sa audience. You did a wonderful job," judge Ogie Alcasid said. "Napapasaya mo ang mga tao. Very well done," judge Gary Valenciano said. The January 2017 Architect board exam or Architect Licensure Examination (ALE) full results to include the list of passers, top 10 (topnotchers), top performing schools and performance of schools are released online in 5 working days after the exam. The Professional Regulation Commission (PRC) and the Board of Architecture (BoA) conducted the licensure exam to one thousand five hundred ninety five (1,595) examinees in Manila, Baguio, Cebu, Davao and Legaspi on January 27 and 29, 2017. UPDATE: 919 passed the examination, PRC announced on Friday, February 3. According to PRC, the target release date of Architect board exam results is on Wednesday, February 1, or in 3 working days after the tests. In the same period last year, results were released in 5 working days after the last day of exam. A total of 866 out of 1,556 successfully hurdled the licensure exam. In June 2016, results were out online after 3 working days. 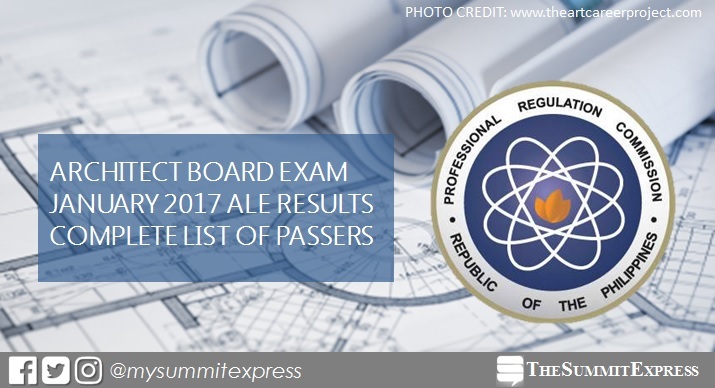 PRC named 1,243 out of 2,224 who have passed ALE. We advise examinees to monitor results from Wednesday to Friday, February 1-3. From February 13 to February 17, 2017, registration for the issuance of Professional Identification Card (ID) and Certificate of Registration will be done on-line. Please go to www.prc.gov.ph and follow instructions for initial registration. Those who will register are required to bring the following: Notice of admission, duly accomplished Oath Form or Panunumpa ng Propesyonal, 2 pieces passport size pictures (colored with white background and complete name tag) and 2 sets of documentary stamps. MANILA, Philippines - Aura Azarcon, dubbed as the "Med of Honor ng Las Pinas," has become the first evicted housemate from Pinoy Big Brother (PBB) Dream Team. In the live eviction on Saturday, January 28, Azarcon was sent home after garnering the lowest percentage of votes among the nominated housemates. She got 22.19 percent only. "No regrets. 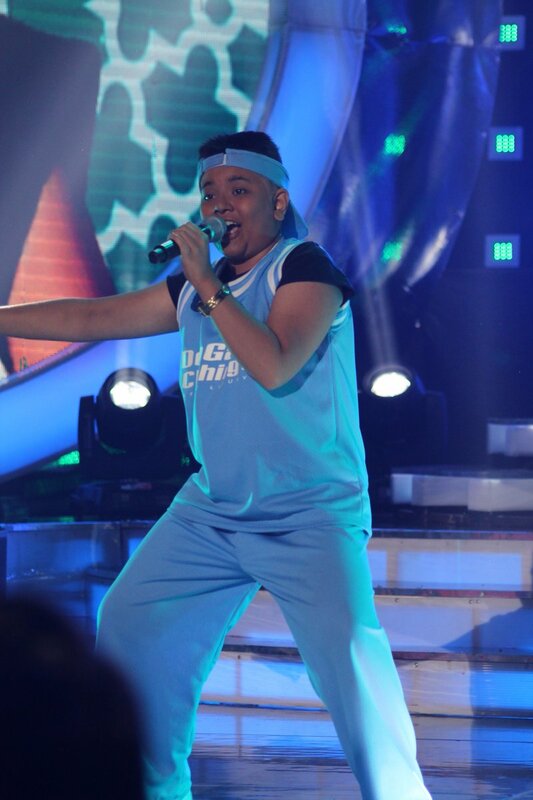 This is the best thing that has happened to me," Azarcon told Kuya during the exit interview. Fellow housemates Jerome Alacre and Jinri Park were saved from eviction after getting, 27.82 and 50-percent of votes, respectively. When asked who should continue the fight on Dream Team, she told Alacre deserved to win. Dream Team housemates did not win their third weekly task called "Lucky Balloon Dragon." In the challenge, they must create a balloon dragon and they must be able to move it through a spiky obstacle course while some of them are blindfolded. They must be able to finish the obstacle without popping more than 21 balloons to win the task. WATCH: Elha Nympha wows anew as Andrew E. on "Your Face Sounds Familiar Kids"
MANILA, Philippines - The Voice Kids champ Elha Nympha gave another strong performance as Andrew E. on Saturday's episode of the hit talent show "Your Face Sounds Familiar Kids." Nympha sang "Humanap Ka Ng Panget" for her latest turn on the stage to maintain lead on leaderboard. She previously wowed with her impersonations of Beyoncé, Meghan Trainor and Sharon Cuneta. Nympha this time around drew praise for another rapping performance. "Today, Elha, na-convinced mo ako na hindi ikaw si Elha. Incredible, Elha," judge Gary Valenciano has commented. "Hindi lang boses ang magaling sa iyo. That was a great performance," judge Sharon Cuneta said. VIDEO: Xia Vigor impersonates Thalia on "Your Face Sounds Familiar Kids"
Other performers of the night include Lyca Gairanod as Tina Turner, Justin Alva as Steven Tyler, Alonzo Muhlach as April Boy Regino, Sam Shoaf as Joh Legend, AC Bonifacio as Alanis Morisette, and Awra Briguela as Yoyoy Villame. Did you like Elha Nympha's performance? Tell us in the comment section below. MANILA, Philippines - Internet sensation and child star Xia Vigor's impersonation of the popular Mexican singer Ariadna Thalía Sodi-Miranda Mottola known as "Thalia" wowed the judges on the fourth week of competition on "Your Face Sounds Familiar Kids." On the Saturday's episode, Vigor once again proved her exceptional talent singing Spanish song "Maria Mercedes." "Meron ka talagang charm, you light up everybody's hearts. Ikaw na ang mini-Thalia," judge Ogie Alcasid has commented. "Ang galing-galing mo this week. You keep to give 100 percent of entertainment value," judge Sharon Cuneta said. "Nakikita namin na nag-eenjoy ka, kaya nag-eenjoy din kaming lahat," judge Gary Valenciano told her. In the past weeks, Xia copied rock star Axl Rose and pop star Taylor Swift, which made international headlines on major news outlets such as Huffington Post, The Daily Mail, Teen Vogue and Mashable. This weekend, witness other kiddie performers: Lyca Gairanod as Tina Turner, Justin Alva as Steven Tyler, Alonzo Muhlach as April Boy Regino, Sam Shoaf as Joh Legend, Elha Nympha as Andrew E., AC Bonifacio as Alanis Morisette, and Awra Briguela as Yoyoy Villame. Don’t miss “Your Face Sounds Familiar: Kids,” Saturday and Sunday night on ABS-CBN or on ABS-CBN HD (SkyCable ch 167).